No more matches, no more hauling around gas, and no more burning your hands trying to pump air into a lantern. 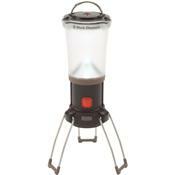 The Black Diamond Apollo Lantern throws out up to 80 lumens of pure light; all it needs is four AA batteries, and it can light a 30-foot radius. The top loop lets you hang it from your tent and the collapsible aluminum legs make the Apollo stable and packable.